EJ Jordan Designs has a long history of selling direct to hi-fi enthusiasts, going back to when the company was founded by Ted and Denise Jordan in 1976. One of the pleasures is the interaction with customers, from answering questions to assisting with advice for whichever loudspeaker project they are undertaking. And at the end, we hope, there is the satisfaction of reading customers’ impressions of the final result. 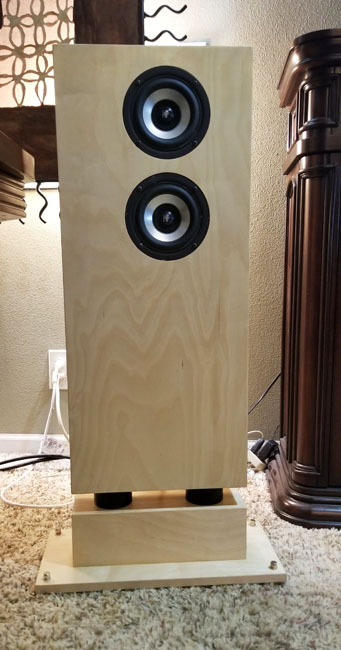 “Being an ‘Old Rocker’ at heart, the DCR build has completely quenched my thirst for a pair of speakers that can be played at high volume levels in my living space without breaking apart. “With super tight controlled bass to spectacular crisp highs, they sit proudly in their new living space. The sound stage is wide and the separation of each instrument and note is spectacular. From soft vocals and small instrumental pieces, to heart pounding complexed electronica, these babies push out ear candy that keeps you wanting to hear more. I am so happy to be washed away with sweet high notes and no harsh ripple or static to my ears. I can hear fine details in music that makes me grin from ear to ear. Slight nuances of the breath on horns and fingers on strings, also small background voices that come to new life having been absent or unnoticeable on other speaker systems. “I wanted a professional finished grade build to accommodate the fabulous sound they produce. 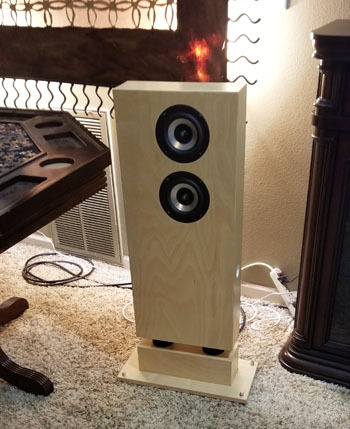 “I thought they should sit a little higher than the actual plans, so I constructed a unique foot for them to stand on that accentuates the dual speaker boxes by using two round pieces that separate the foot, which I think looks quite lovely. You can find the Eikona DCR, among other plans, on our Loudspeaker Plans page. And please remember that if you are embarking on a build, we are happy to answer any questions and always interested in photographs of the final result.